The yield on the benchmark US 10-year Treasury note fell to its lowest since December 2017. Japan's All Industry Activity Index for January resulted at -0.2%, missing the market's expectations. The USD/JPY pair corrected higher at the beginning of Monday, to reach a daily high of 110.23, to later resume its decline and near a fresh 1-month low of 109.70 posted early Asia. Much of the pair's behavior was directly linked to that of US Treasury yields, as the yield on the benchmark 10-year note surged to 2.47% ahead of the opening, to later fall to 2.38%, its lowest since December 2017, mid-US afternoon. Japan's macroeconomic figures were again discouraging, as the All Industry Activity Index for January, which resulted at -0.2%, missing the market's expectations of a 0.2% advance, while December figure was downwardly revised to -0.6%. Nevertheless, the inversion of the US yield-curve weighed more, boosting demand for safe-havens yen and gold. Japan will release early Tuesday the February Corporate Service Price, previously at 1.1%, and the BOJ Summary of Opinions. Now back to the 110.00 price zone as yields also bounced, the pair is technically bearish and poised to extend its slide according to the 4 hours chart, in where the 20 SMA keeps heading lower almost vertically above the current level and further below the longer ones. 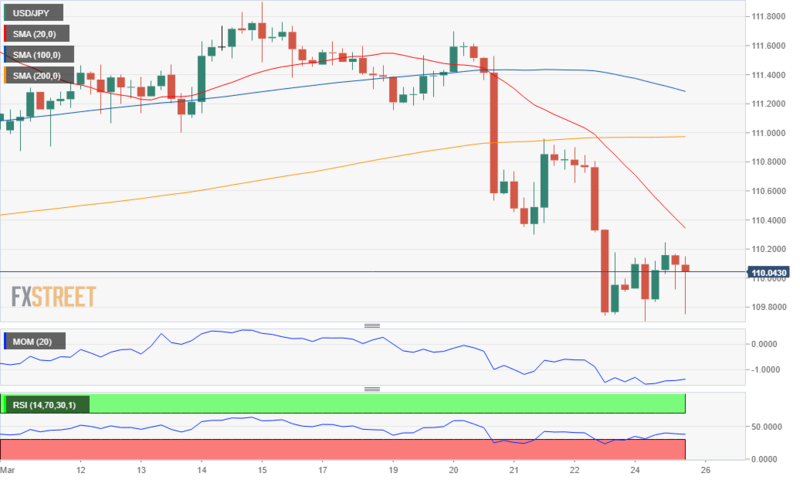 Technical indicators in the mentioned chart resumed their declines within negative levels after correcting the oversold conditions reached at the beginning of the day. A steeper decline is still possible on a break below 109.70, the daily low and the immediate support.